The World Cup Cricket fever was short lived. It seems to have ended before so many great games –thanks to Team India. They proved to be the most hated from being the “icons” of today’s India. The best tease was about blaming Indira Gandhi for their loss to Bangladesh. Why? She created Bangladesh. Cricket is a crazy game. I didn’t realize it could take so much of your being till our recent varsity week fever at the university. Yes, I am playing cricket and I am actually the wicket keeper for our girls’ team. We won our first game and are preparing for our second game this Tuesday. The best part however, is our coach who is so passionate about the game that we had better be the best cricket players in the field. The coach and his teammates played yesterday and it was an amazing win. 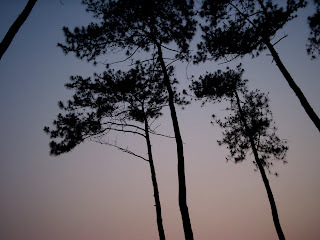 Before catching the bus back, I got to see a beautiful sky well decorated by NEHU pine trees. He.. he.. a little bit of Northeast ladies for you all. Yesterday was a big day in Shillong town. The President of India was here and he also spoke to us students at the North Eastern Hill University. Yours truly was one of the ten students from Northeast receiving the president in their cultural attire. I represented Sikkim. I know, I know… I am not exactly from Sikkim (where am I exactly from?) but for the sake of Mayel Lyang and the Lepchas around, I gladly donned my Rongdum and became the cultural ornament for the day. Otherwise, the one thing that stands out from the speech was him saying, “Please visit my website at www.presidentofindia.nic.in.” And I did visit the site. If you want to, you can even email him and I am highly optimistic that he might just respond? Bronislaw Malinowski highly advocated the usage of imponderabilias in ethnographic writing. I wish every action every day would include an imponderabilic decision. I recently picked up “Teilang –a novel” by Yona M. Nonglang. It doesn’t include much detail about the author and I am hoping I’d “accidentally” meet the writer in the streets of Shillong. But the prologue starts with a Shillong sunset description. So, I think our minds were thinking alike? I have always felt quite the same and my invisible artist is most certainly God—the artist? Unfortunately, the current weather in Shillong town is not permitting the exhibition of beautiful evenings to be showcased yet… and I eagerly anticipate the day it opens and watch the sun go down.